Calcium and Magnesium are both essential factors in the formation and maintenance of healthy bones but they also play an important part in the contraction and relaxation of muscles, including the heart. When calcium flows into the muscle tissue cells they contract. 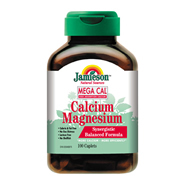 When calcium leaves, magnesium replaces it and the muscle relaxes. They also work together to normalize the muscle tone of blood vessels.